The Avg. Group Saves 5.7%! 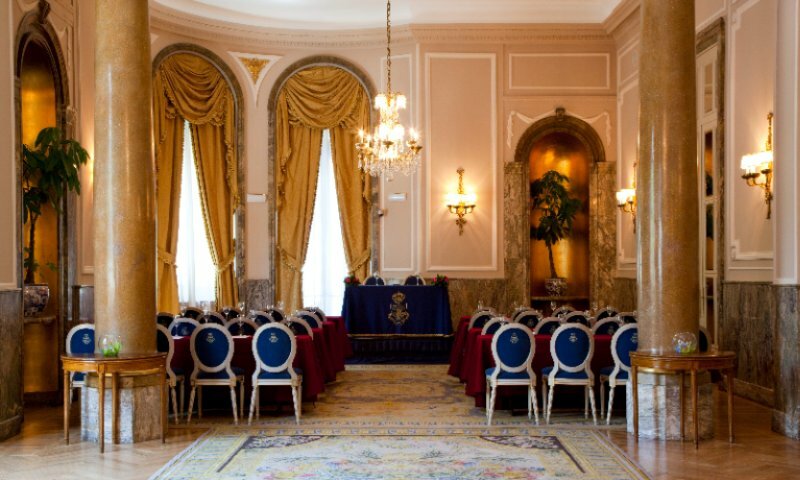 The Ritz is located in the very heart of Madrid, opposite the Prado and Thyssen Bornemisza museums and just a short stroll from the picturesque Retiro Park and Botanical Gardens. 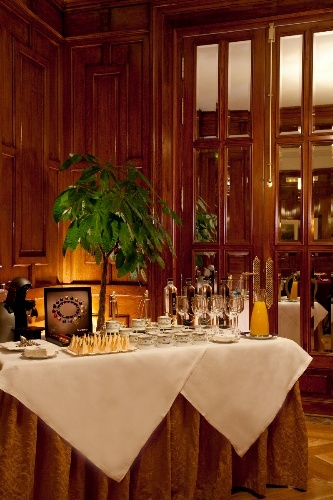 Ritz Hotel in Madrid, where Castilian tradition meets international panache at the heart of the Spanish capital. Located between the Prado and Thyssen museums in the fashionable Retiro district, the Ritz, with its leafy garden and elegant terrace, is an oasis of tranquillity and architectural splendour. 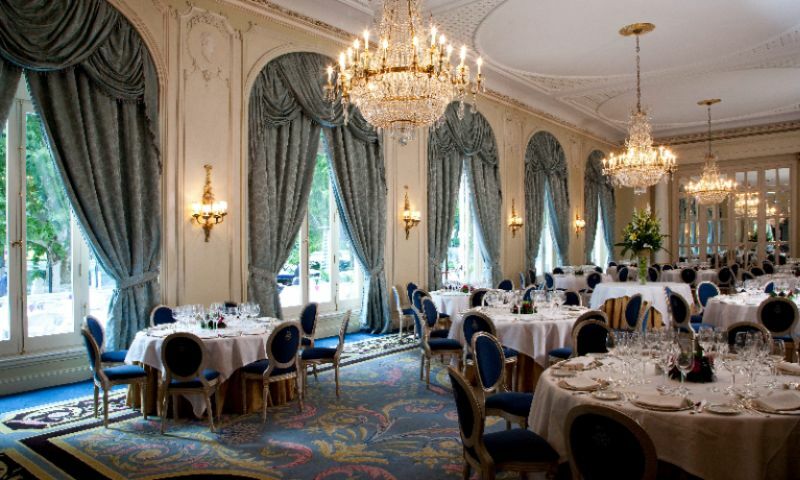 A magnificent example of the Belle Époque style, the Ritz has been entertaining royalty and heads of state since its inauguration by King Alfonso XIII in 1910. Today, with its individually designed rooms, superb cuisine and impeccable service, it remains faithful to those standards of excellence that have placed it among the worlds premier hotels. Without any charge 60 days before arrival.reduction of less than 50% of the initial reservation, no penalty if carried out 30 days before arrival.Reduction of less than 50% of the initial reservation , no penalty of carried out 30 days before arrival. Continental Breakfast included in room rate.Full buffet breakfast: 11€ supplement per person and per day. 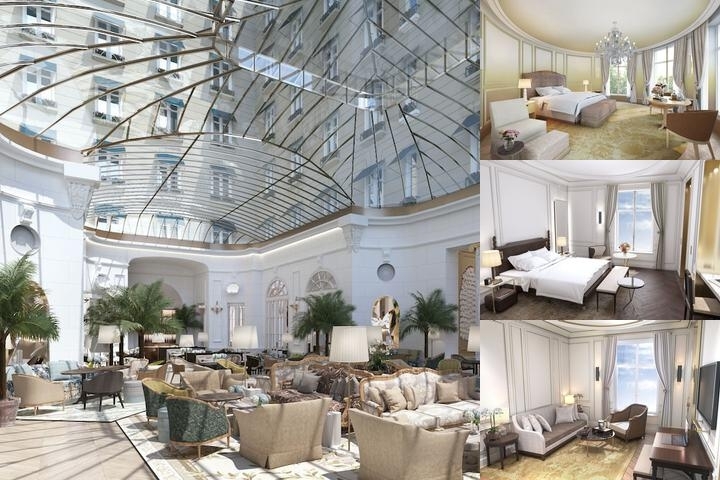 Below are the meeting, banquet, conference and event spaces at Hotel Ritz. Feel free to use the Hotel Ritz meeting space capacities chart below to help in your event planning. Hotel Planner specializes in Madrid event planning for sleeping rooms and meeting space for corporate events, weddings, parties, conventions, negotiated rates and trade shows. The Salón Real is the largest function room in the Hotel Ritz, and is perfect for important product launches, fashion shows, wedding celebrations and elegant black tie balls.It has a splendid hardwood floor with marquetry inlay, large windows and an enormous mirror along one wall.Easy access direct from outside the Hotel Ritz, through the doors leading onto Calle Felipe IV, makes it a unique space for the exhibition of large items such as automobiles. 20 x 12 x 5 M.
Salón Felipe IV is perfect for all types of private events as it can accommodate up to 110 guests for a banquet and 250 guests for a reception.Designed in gentle, sober tones, this light-filled hall offers a refined atmosphere for your event. 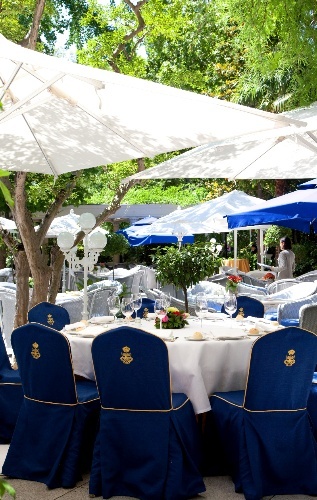 Direct access to the terrace and gardens of the Hotel creates an extra special atmosphere. 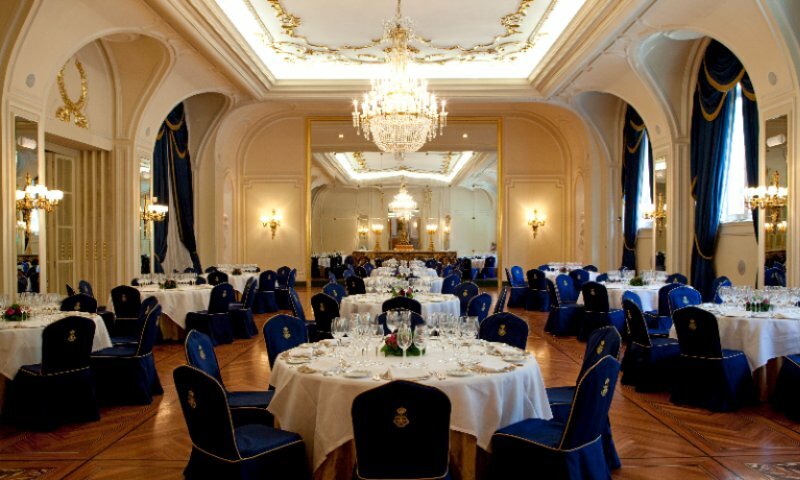 17 x 8 x 5 M.
Salón Alfonso XIII is one of the most distinguished salons in the Hotel Ritz making it perfect for grand banquets and events, in an elegant atmosphere.It is accessed directly from the Hall Alto, and features beautiful glass doors leading out onto the hotel's terraces and gardens. A hand made carpet from La Real Fábrica de Tapices covers the floor, while two enormous XVII century carpets adorn the walls.Salón Alfonso XIII is easily expanded to accommodate more people as it is connected to both the Salón Felipe IV and the Salón Goya. 24 x 8 x 5 M.
Designed in traditional English style, the beautiful wooden panelling is the focal point of the Salón Real Academia.Its rectangular form is preceded by a small vestibule, making this the perfect venue for intimate private dining and small receptions. The Real Academia salon can accommodate up to 30 guests for dinner. 7 x 5 x 5 M.
With their own independent entrance as well as access directly from the Salón Alfonso XIII and the Salón Goya, the terrace and gardens of the Hotel Ritz create the perfect setting for large scale receptions and cocktail parties.The characteristic blue and white awnings protect guests from the heat of the day on the terrace, whilst in the Garden the beautiful trees provide gentle shade.A flexible space that can be adapted easily to your requirements. 30 x 14 x 10 M.